Keep those miles and points balances full with these latest and greatest mileage promotions and travel news. If you sign up for air berlin’s Top Bonus loyalty program , sign up for its email newsletter, and refer friends to join, there are free points coming your way. As many as 9,500 free miles! For the first friend that signs up, you earn 500 miles. For subsequent friends, earn 1,000 miles up to nine more times. That’s a total of 9,500 miles for referring 10 friends by July 31. Your friend gets 1,000 miles, too. If you’re not a member, sign up to receive 500 miles as a welcome bonus. With the signup and referral bonuses, you can earn as many as 10,000 miles, which is enough for a free one-way ticket within Europe on Air Berlin or its partners (including Alitalia, British Airways, Finnair, or Iberia). The airline has some award flights that are cheap as 2,500 miles! While the airline does add fuel surcharges to its award tickets, these miles could still save you cash if you use them wisely. American is putting its miles on sale, for those that purchase them, that is. You can save 10% when buying miles or as much as 30% if sharing miles with others. It’s rarely a good idea to buy miles outright, but if you are in need of some miles to reach an award ticket, it’s better to do it when there are bonuses up for grabs. Between now and Sept. 11, travelers that opt to receive airline miles instead of Marriott points can get up to 1,000 bonus miles per stay. U.S. carriers are not participating in this promotion, but European airlines like Air Berlin and Lufthansa are. You won’t earn enough for a free flight, but it will help you slowly get there! In what has to be one of the least valuable redemptions out there, Alaska is letting its members redeem 65,000 miles to waive the $100 TSA Pre-Check. You still have to go through the background check and enrollment process. Consider those same miles can be used for at least two free domestic tickets or one international roundtrip to Europe. But, if you have plenty of miles to spare, you have another option at your fingertips. Get your wings ready! Virgin America is offering a big mileage offer this summer with a 50% bonus on mileage for flights between now and the end of August. While Virgin America awards miles based upon dollars spent, this promotion is still a lucrative way to stock up on Virgin America Elevate points. You can pretend like you’re a big spender even when you are not! Be sure to register for the promotion before your flight. Just like buying points is not always the best proposition, neither is transferring points between partners as there is potential value to be lost. 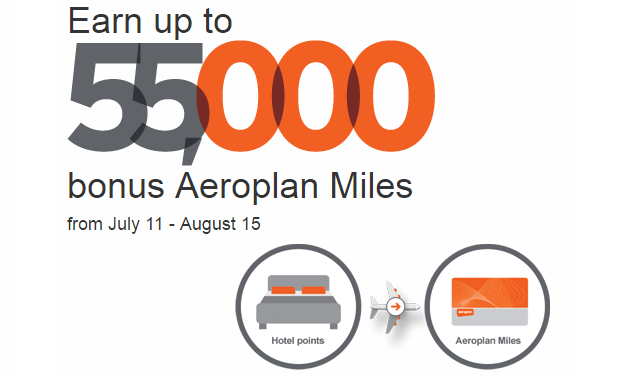 But, Aeroplan has come up with a juicy promotion that awards as many as 55,000 bonus points into its program when transferring points from hotel partners. The cool part about this promotion, which offers bonuses based upon the cumulative number of miles or points transferred, is that they don’t all have to come from the same program. So this could be a great way to clean out orphan accounts as well as for big redemptions on Aeroplan’s Star Alliance partners. Just beware that many Aeroplan redemptions come with fuel surcharges. This offer lasts until Aug. 15. Like the Aeroplan offer, Etihad is offering a 25% bonus for transfers into tis Etihad Guest program. What is unique about the Etihad offer is that it is not just hotel partners that are included, but others like Citi ThankYou points and Heathrow Rewards points, too. Etihad’s points can be used to redeem for its epic first class apartment on flights between Abu Dhabi and London, Melbourne, Mumbai, New York, and Sydney. You can also redeem Etihad points on its partner airlines at surprisingly good rates. Their partners include Alitalia, American, and Brussels Airlines among others. The transfer bonus is available through July 31. Delta puts domestic award flights on sale, but hurry though! Act fast on this offer. Between now and July 18, you can secure some pretty sweet mileage discounts for domestic Delta flights. One-way flights are pricing as low as 5,000 miles, which for Delta, is incredible. Book flights this week for travel between August 23 and February 10 of next year. There are a few blackout dates during holiday periods, but the rest of the season has plenty of availability. Keep in mind there is a three-week advance purchase requirement. Enroll your United-branded credit in the Visa Checkout program and spend $5 using the service within 15 days of signing up to earn 500 bonus miles. The offer is valid through Sept.30, and the purchase must be made with your enrolled credit card to be eligible. 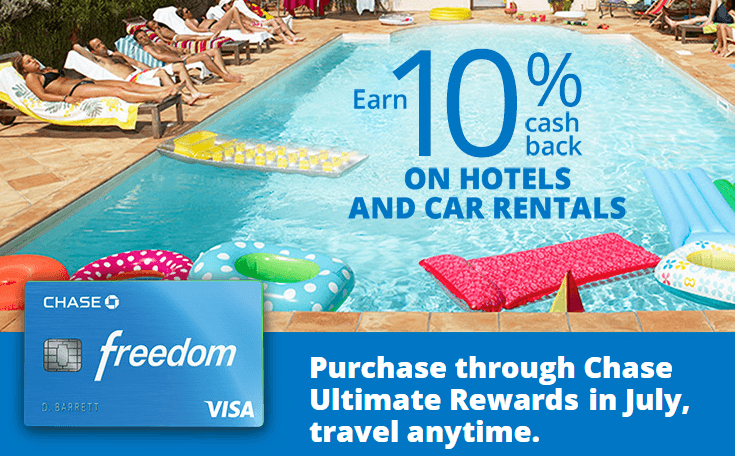 Chase Freedom credit cardholders can earn extra cash back or bonus points on hotel and car rental purchases up to $2,500 made with the credit card between now and July 31. This means that travelers can earn as much as $250 back for their hotel and car travel plans if they book through the credit card’s online travel portal.